Have you ever walked across a marsh, up a seemingly innocuous grassy knoll under a big gnarly tree, then noticed you’re standing in the middle of an ancient cemetery? Then the sky darkened and clouds started tumbling and suddenly, the earth parted and a bony hand reached up and grabbed your ankle?! Yes, this is that place but safely tucked inside a tabletop Wardian Case from H. Potter (no, not THAT H. Potter). I’ve outlined here the materials and methods I used to create this miniature cemetery of the rising bones. 2 or 3 other tiny plants, mine are 2 miniature orchids but you could use ferns or ivy just as well. *NOTE: Make certain that the plants you choose share similar environmental needs such as lighting, moisture and soil types. Since my orchids have different soil needs than the ficus, I planted them in short pots with their bark blend and buried the pots in the potting soil, below the moss. Otherwise, they’re ok with the light and humidity requirements shared with the ficus. Make sure you measure your case AND plants to ensure everything fits comfortably or you’ll have one angry skeleton haunting you at night. Click to enlarge. 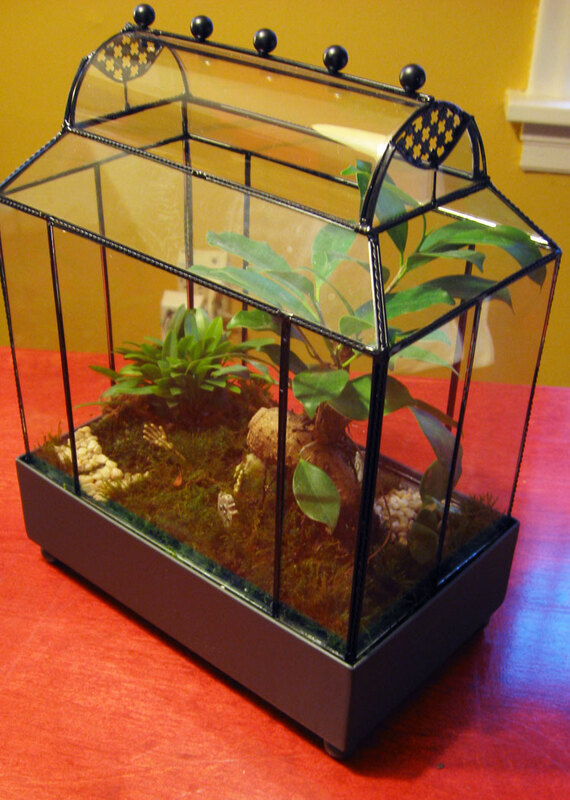 Put an even 1-inch layer of drainage pebbles and charcoal in the bottom of your terrarium or Wardian Case. Do a dry run and try different arrangements of the plants until they fit together well and look natural. Try to envision where you’ll put moss vs. pathways. You can also incorporate twigs and larger rocks for an additional woodsy feel. 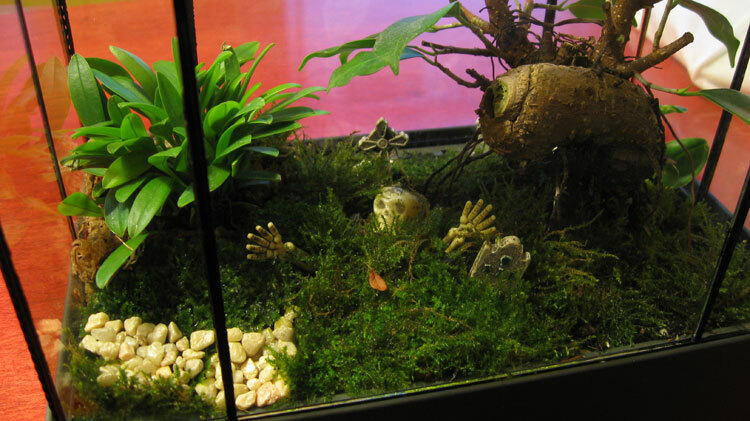 Make sure your skeleton and headstones are appropriately sized for the terrarium and plants. The smaller these items are, the bigger your tree and plants will look. I cut the arms and skull from my skeleton so I didn’t have to bury the entire fellow. Place the tree first, then your smaller plants. Dampen your soil medium (damp, NOT soggy!) and then fill in the areas around your plants. Try sculpting the soil into hills and valleys if you have room. I found a simple teaspoon works well for this. Place your headstones and skeleton where you want them and fill in around them with chunks of moss. 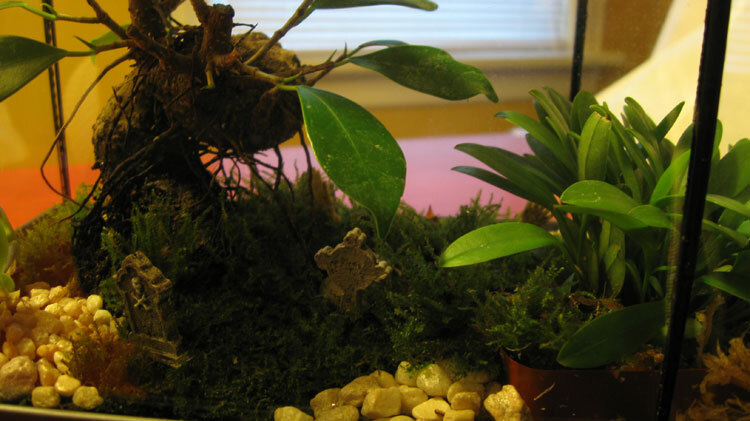 I used thin wooden skewers to help place the tinier pieces of moss. The hands I placed as though they’re reaching upward from the grave and the skull peeking out from the grass/moss. Create any pathways you want with pebbles and add any additional items like twigs and larger stones. Water the soil gently if the medium was kinda dry while working with it or if the plants were dry. 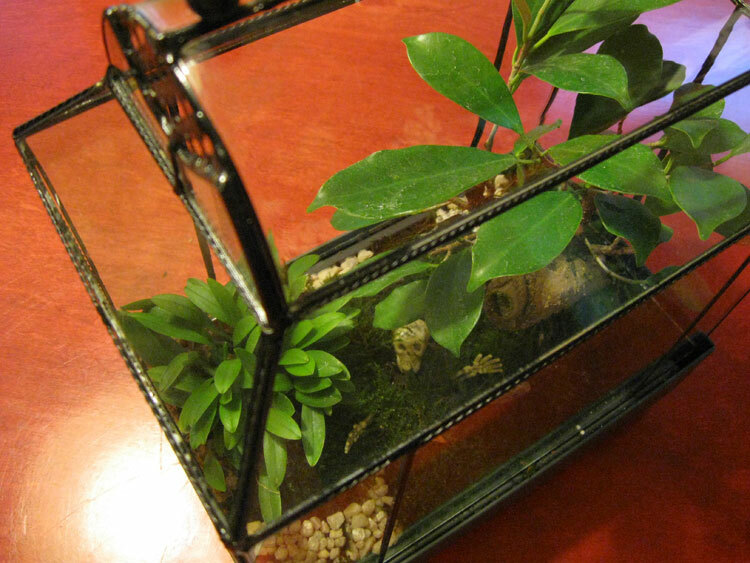 Finally, just place the cover of your case or terrarium carefully over the plants and position in a spot with appropriate lighting for the plants you chose. Now you have a TERROR-arium just in time for Halloween. These make great centerpieces for the dining table. The bonsai tree I selected was a gnarly stumpy ficus that looked like some sort of creature by itself. Click to enlarge. The table top Barrel Roof Wardian Case from H. Potter. Click to enlarge. You know those cheapass bonsai trees at the mall or big box store for 10 – 15 bucks? Yeah? Did you know they’re derogatorily referred to as mallsai?! ha! And with good reason. These poor plants are created and dressed to sell, not to live in your home. Evildoers that dress these plants up do three things that will eventually kill the bonsai: use crappy clay soil that compacts the roots, terrible fakey green moss GLUED to the soil and/or tree, and pebble paths that are shellacked or otherwise glued together in such a way that water and air cannot reach the roots of the bonsai. This is why you MUST carefully clean off all this crap as soon as possible and re-pot the bonsai. But do a little research first and buy a soil medium appropriate to the bonsai tree you chose. If it’s a juniper, you’ll need something more acidic for example. Here’s a great wiki post on saving a mallsai. There is a lot of good info available if you just google ‘mallsai’. I wouldn’t necessarily pass up a mallsai but I’d make sure I got one without dead leaves or branches and did not look like it had been sitting in the store for months. Unless you’re planting a Terror-arium in which case, a dead tree could be just the thing you need. Mr. Bony rising from the grassy knoll beneath the creepy tree. Monica! Is that a chainsaw ur holding? Ur such a badass grrrl! I’m thinking you could do something like this with your human-sized greenhouse. A little police tape and you got yourself a crime scene! It came out really cool. I like the skeleton. I love this! I have two giant pickle jars stashed away that I wanted to use as greenhouses, but this is just AWESOME!